Our new working paper explores healthy home concerns and behaviors among American homeowners and renters. We show that both groups are interested in improving the indoor environmental health of their homes, but face myriad challenges to doing so. Below, we highlight three important steps we can take toward improving the health of our housing stock. Healthy housing is becoming more than a niche market. Nearly one in four households in our survey had some concern about health-related issues in their homes, and more than 20% acknowledged uncertainty about whether their homes might contain health risks. 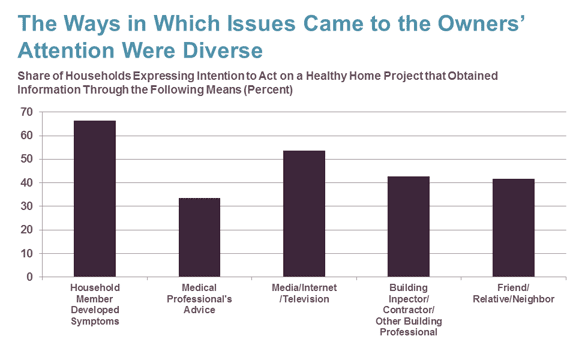 Nearly half of American homeowners responding to our survey have some level of interest in healthy home issues. In fact, 60% had already taken action – even if minor – to create a healthier indoor environment at home. Notes: Sample size is 529. 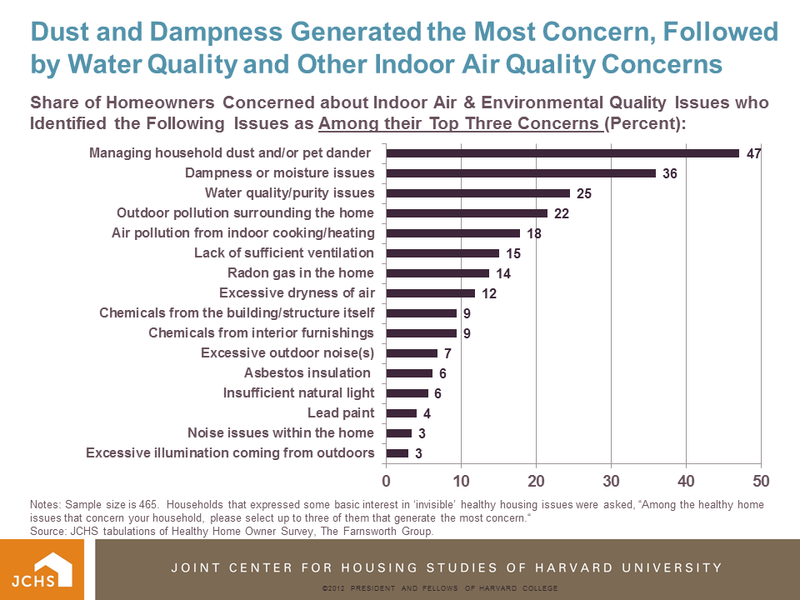 Households that expressed some basic level of healthy housing concern were asked, "Which general category(ies) best describes your concern about the impact of your home on your household’s health? "Source: JCHS tabulations of Healthy Home Owner Survey, The Farnsworth Group. 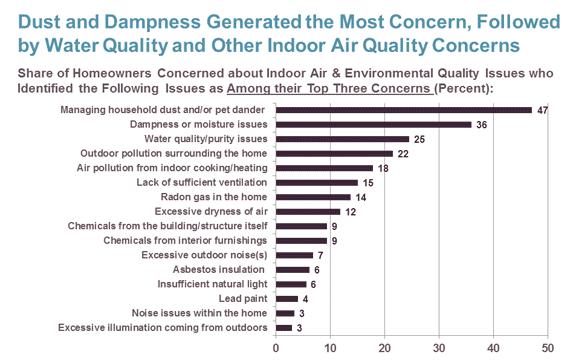 The leading concern among respondents was indoor air quality (IAQ). As outlined in our paper, the most important action we can take to improve residential IAQ is to reduce indoor emissions, including the pollution that comes from heating and cooking, as well as from chemicals that are off-gassed by our furnishings, carpets, paint, and the materials used in constructing our homes. It is therefore critical that both consumers and building professionals have more options for non-toxic/less-toxic materials and products. In a recent example, Home Depot and Lowe’s announced that they would stop selling flooring containing phthalates, a category of chemicals believed to disrupt human hormones. This “retailer gatekeeping” is one way to start shifting away from hazardous products and toward safer ones. As consumer demand grows and is recognized, forward-thinking manufacturers, retailers, and service providers who make healthy building a priority will be in a strong position to serve this market What’s good for health and the environment will also be good for business. Notes: Sample size is 465. 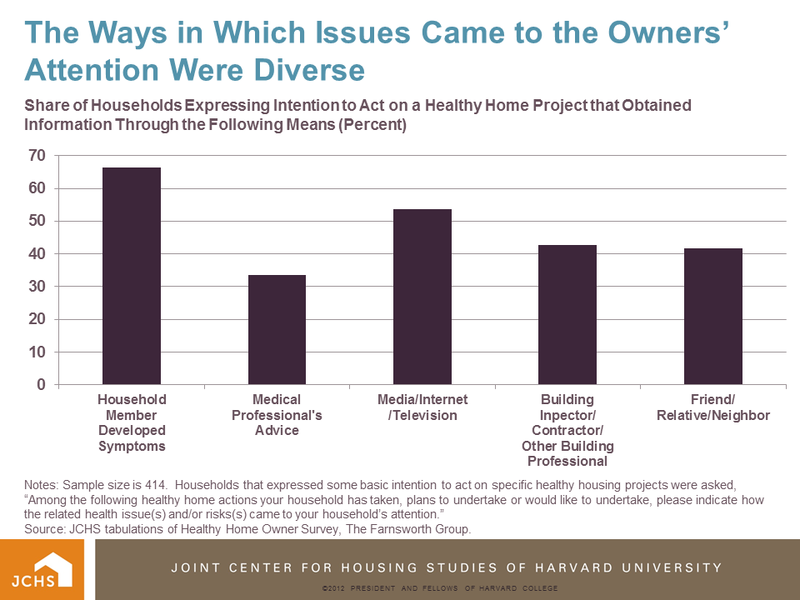 Households that expressed some basic interest in ‘invisible’ healthy housing issues were asked, “Among the healthy home issues that concern your household, please select up to three of them that generate the most concern." Source: JCHS tabulations of Healthy Home Owner Survey, The Farnsworth Group. 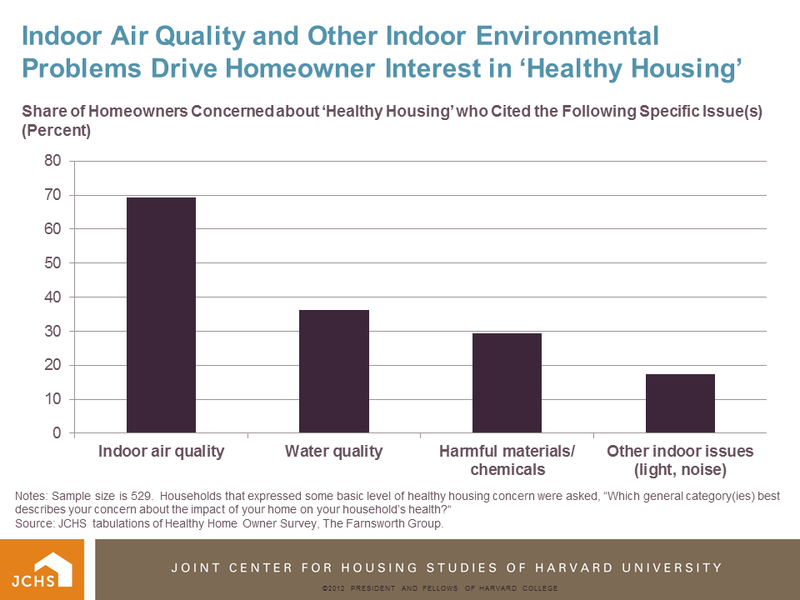 One encouraging conclusion of our working paper is that both homeowners and renters are interested in making their homes healthier, especially by improving indoor air quality and water quality. However, these same consumers report that information – including a lack of time to research options – is an obstacle to taking action. They are suspicious of spurious environmental and health claims (“greenwashing”) and aren’t sure where to turn for trustworthy, science-based information on healthy home products and services. This problem is amplified when the potential project – remediation, remodel or replacement – is costly in terms of money, time, and energy. A homeowner concerned about potential mold or unhealthy insulation might be just as worried and confused about whether remediating the problem can guarantee a healthier home or improve symptoms such as asthma or allergies. Another dimension of this problem is the sheer volume and complexity of scientific information on indoor air and environmental quality. Cutting-edge research – including such topics such as indoor microbiomes and chemical interactions with moisture and UV light – is truly fascinating. However, it is not actionable for the average consumer. Moreover, as interesting as research on emerging issues is, it is important that we not lose sight of older yet persistent healthy housing concerns that have affected our housing stock for generations. In fact, the Lumber Liquidators disaster of 2015 was due to high levels of formaldehyde, one of the first three major indoor air pollutants that were identified back in the 1970s, along with radon and combustion pollution from heating and cooking. These are still serious healthy housing issues, as is lead paint. The Lawrence Berkeley National Laboratory has been a leader in indoor air quality research since the 1970s and offers a wealth of resources (designed for the public) on these issues. Both our survey and the American Housing Survey show that numerous Americans still face basic structural integrity/safety problems in their homes, including insufficient insulation/weatherization, inadequate heating/cooling, electrical and plumbing problems, and pests. More attention to solving basic problems like these would go a long way toward making our housing stock healthier (for example, by helping to reduce the infiltration of outdoor air pollution, particularly in neighborhoods located near highways, airports, or industries.) While increased attention to chemicals and emerging issues is a positive development, we don’t want to neglect these critical basic issues. Ever since the oil crisis of the 1970s, demand for energy-efficient homes has grown and building professionals have responded accordingly. Now, the construction/homebuilding/remodeling industry should do the same for healthy home concerns. 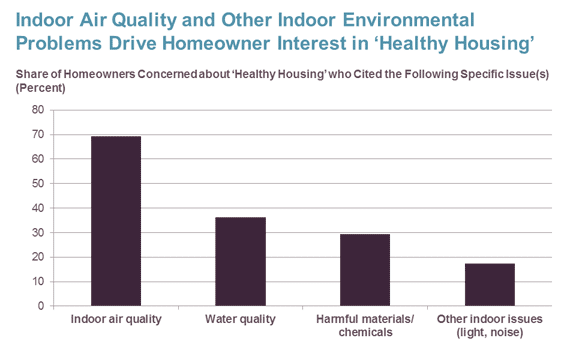 As discussed in Point #1 above, consumers want their homes to contain fewer toxic materials and have good indoor environmental quality overall, but they need trustworthy expertise, services and information from the industry. Because energy efficiency and indoor environmental/air quality are so intertwined, this creates a natural opportunity for knowledgeable contractors to help their clients integrate both energy and IAQ concerns into upgrade/remodeling projects. Building professionals who have relevant expertise – which includes knowledge of healthier/non-toxic materials and practices – will have a distinct competitive advantage both with individual homeowners and owners of multifamily buildings. Our paper shows that renters want healthier options, just as they want “green” units. Fortunately, there is a growing number of initiatives that work to help building professionals develop this expertise, such as Healthy Housing Solutions, which offers training courses, as well as the National Center for Healthy Housing, the Healthy Building Network, the Perkins and Will Transparency project , and the Green and Healthy Homes Initiative. The Department of Housing and Urban Development’s strategy for action is another valuable resource. Going forward, we hope that a focus on these three areas might go a long way towards improving the nation’s housing stock and the experience of the housing consumer, while also improving the nation’s overall health. This blog is reprinted with permission. You can view the original post here. Dr. Mariel Wolfson recently completed her PhD in the History of Science at Harvard, where she wrote her dissertation about the history of green and healthy housing in the United States (“The Ecology of a Healthy Home: Energy, Health, and Housing in America, 1960-1985"). While writing her dissertation, Dr. Wolfson was the Meyer Fellow at Harvard's Joint Center for Housing Studies (JCHS), and is currently collaborating with the JCHS on a project exploring healthy-home concerns and behaviors among American homeowners, renters, and contractors.